The equipment to do this can be pretty basic. They started out just with an app on their phones, to transmit, the app loads the image and plays a series of tones (FSK) as each line of the image is transmitted. If you don’t have a cable into your transmitter, you key the transmitter and hold the phone speaker up to the mic. A similar arrangement is possible for receive – the phone is left near the transceiver speaker and converts the tones (and any nearby noises) back into an image. Crude, but results are possible. A much improved result can be obtained by connecting the transceiver to the decoding device (usually a computer tablet or smartphone). 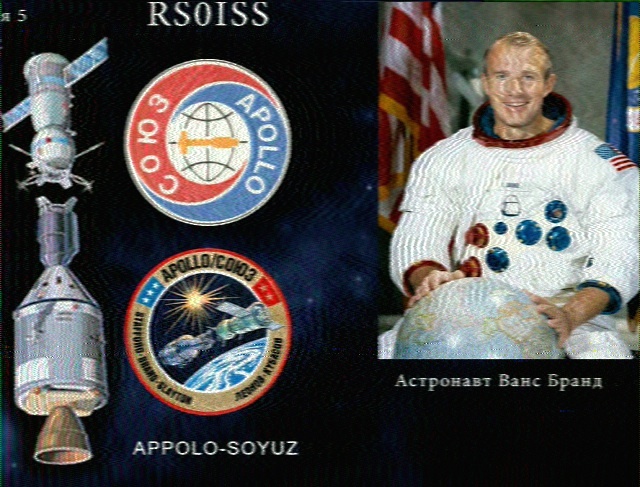 Last Friday Brian advised that the International Space Station (ISS) was planning to transmit SSTV to commemorate 40 years of space cooperation between the USSR and the USA that started with a Soyuz docking with one of the last Apollo missions. It’s not well know outside of radio circles that almost all astronauts and cosmonauts are licensed amateur radio operators and that they occasionally operate the ISS ham radio station, especially with groups of school children. We used the satellite prediction service on the Heavens Above website to look at the available passes. Based on my experience of SO50 I was discounting some of the lower passes. This changed when Steve VK6HSB reported that he had heard a good carrier (but no modulation) on one of the low Friday night passes. When I tuned in on Saturday afternoon for a pass, using my WARG unity gain pogo stick for an antenna, I too heard a full quieting carrier for about 3 minutes – all that would be needed to receive an image. For decoding the images, I have an old Nexus 7 Android tablet I purchased off ebay. 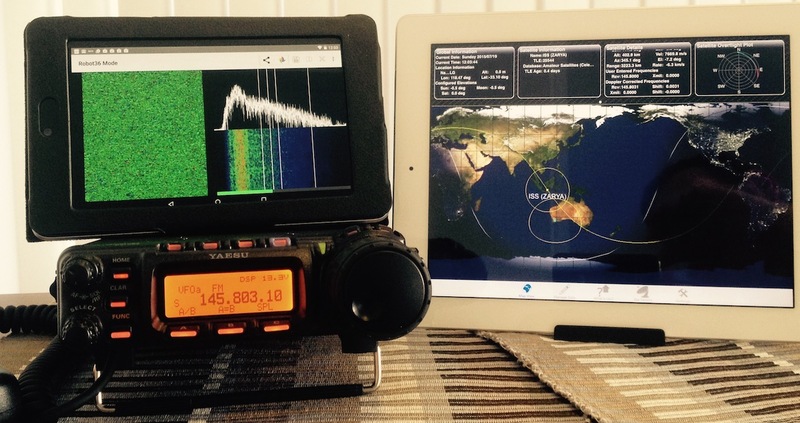 A lot of ham radio software runs on Android (to a much greater extent than iOS). However I made a mistake with this purchase. I wasn’t aware that it does not have a ‘mic in’ in the headphone plug, so I was restricted to using the tablet-sitting-on-the-speaker method. The ISS was transmitting in the PD180 format, and I used a free app called ‘Robot-36‘. Saturday lunchtime I had some success. Here is the image I received. The green dots are caused by noise. Some of it over the radio, but some just environmental noise in my unit. This was still a low-ish pass. Another was scheduled for about an hour later. I was better prepared for the next pass. I used HamSat on the iPad to show the location of the ISS as well as to calculate the changes to the receiving frequency required to adjust for the Doppler. In the next pass a couple of much better (but still far from perfect) images were captured. In this same pass, Brian captured a near perfect image using a cable. On Sunday we discussed the operation – working together on these sort of projects is a great way to maintain the enthusiasm by getting helpful advice from each other to make success more likely, as well as getting encouragement for your efforts when things don’t work perfectly. It’s possible to do SSTV on HF, so I think I’ll acquire or make a basic cable and investigate Mac software for the mode. Posted on July 26, 2015 by I Bailey. 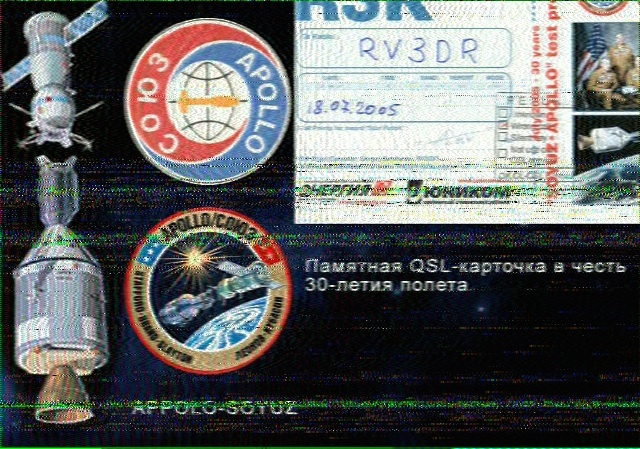 This entry was tagged Android, BRC, FT-857D, iPad, ISS, Nexus, Robot-36, software, SSTV. Bookmark the permalink.